It’s September and Fall is almost here! The leaves will be changing soon, and pumpkins will be taking over everything from the front porch to my coffee! Which means that the most MAGICAL time of the year is just around the corner! Are you thinking about your Christmas gift list yet? I thought so! Sooooo KEEP READING! I am so BLESSED (ha, see what I did there?) and pleased to announce and offer to you my very first workshop kit, the So Blessed Mini Album. After weeks of blood, sweet, and tears, it is finally ready! So what do you think??? For this mini album I have used the Rustic Home Fundamentals paper collection and I am so pleased with how it turned out. With its earthy tones, this album is so versatile and can be used for many occasions and its a wonderful gift too! The best part is, just by adding an additional All Together Compliments, Memo Fundamentals paper, and a few more sheets of Sea Glass and Cocoa, you can make TWO of these adorable little albums! Make one for yourself, and one to gift! For the tutorial on how I built the paper bag mini album, click HERE! 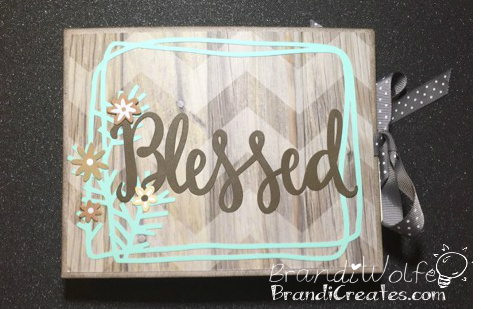 Your So Blessed Mini Album Workshop will come with everything you need to decorate your mini album, PLUS all of the Circut images already cut AND stamped from the Flower Market Cricut Collection. Because we only use half of the Rustic Home Fundamentals to make the mini album, its simple to double the Memo Fundamentals, All Together Compliments and cardstock needed and make TWO albums, one for you and one for a gift! Please allow 2-3 weeks for these Workshop Kits to get to you. I have to order the product from CTMH and then cut each kit before shipping them on to you. $10 Priority Mail shipping will be added to your Paypal invoice. If you enjoy cutting and stamping your own workshop kits, feel free to purchase the supply list from my WEBSITE and I will send you the Downloadable Workshop Guide for FREE. Simply email me upon order and I will send it right over. Please note: You must have the NEW Flower Market Cricut Cartridge to cut this kit. Want just the Workshop Guide? No problem! The Downloadable Workshop Guide contains detailed photos, a cutting diagram, and Cricut Design Space files to help you assemble your mini album.